Another delicious breakfast cooked by Kagi, followed by washing with the locals, our system is slightly different to theirs, where as we just dip ,dip, dip, they go bash, bash, bash on a rock (sheer entertainment for all). We then departed n our day hike to Dangsing and Fulkarkha, arriving at Dangsing temporary school we were greeted by the excited children, teachers and school committee who presented us with a continuous flow of mallas made from an array of different flowers from their gardens, these were then placed around our neck as a sign of greeting. The committee welcomed us with a thank you speech and inviting us to the official opening of the school. We were then blessed with a tikka of red due plastered all over our faces. We departed Dansing for Fulkharka which is a small town with 4 local shops, and most importantly the high school of the whole district, which accommodates 750 students. Fortunately the school was not damaged, but the primary school was destroyed. 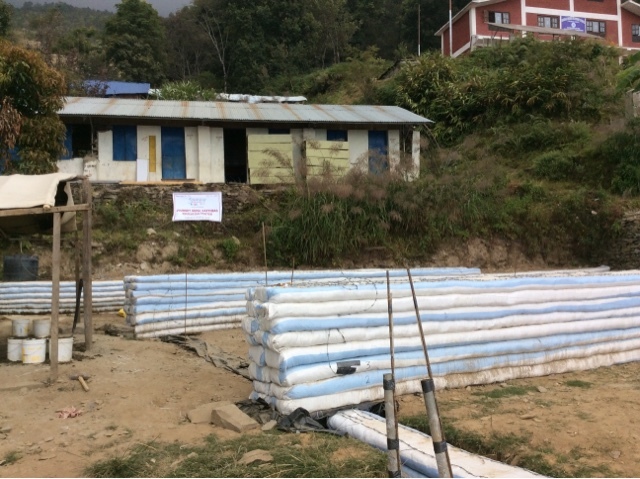 Thankfully a company in Nepal is being financed by donors to rebuild the school n Earthbag design. We met the international group helping to rebuild with this design, and it was supervised by an experienced Earthbag builder from France, trained by the company that established the Earthbag design n California. Later in the day after Dhal Bhat at a local restaurant, no where near as good as our Kagis food we endulged in dime local retail therapy where Jen bought her local rum supply, and bought her jewellery supply, I bought a headscarf and johnsons baby powder!!!! On our return to our camp site we collected our toiletries and headed to the local tap for a wash at our very scene 4 stat outdoor shower!